As first described by Claude Bernard in 1854, for animals to survive, they must maintain a constant internal environment, including a balance between the gain and loss of water and salts. If excessive water is gained, cells swell and burst; if water loss is too great, cells shrivel up and die. The processes animals use to maintain this balance, osmoregulation, involve two different approaches. Osmoconformers include most marine invertebrates whose internal salt and water concentrations are equivalent to their external environment. They “go with the flow” and have no need to actively control their salt and water balance. By contrast, many marine vertebrates, such as fish, have internal salt concentrations different from their external aquatic surroundings and must actively control their salt concentration; they are osmoregulators. Freshwater fish live in water that is far more dilute than their body fluids and face the problem of salt loss and excessive water gain. They deal with this by drinking almost no water and excreting large volumes of highly dilute urine. Salt stores are built up by eating and by the active uptake of chloride ions across the gills into the body, followed by sodium ions. Marine fish are faced with the reverse problem—living in water that is far more concentrated than their body fluids—and, therefore, they face the loss of body water and the excessive movement of chloride and sodium ions into their body. Their strategy involves drinking large volumes of water and actively transporting chloride ions across the gills and out of the body; once again, sodium ions follow. In 1930, Homer Smith, working at New York University and the Mt. Desert Island Biological Laboratory, determined many patterns of marine fish osmoregulation. The survival challenges are even greater for anadromous salmon, which, after spending most of their lives in the ocean, then breed in freshwater. After using the osmoregulatory strategies noted above, their acclimation from freshwater to saltwater and back again is not immediate. Salmon remain at the interphase of freshwater and saltwater for days to weeks before moving forward. SEE ALSO: Fish (c. 530 Million BCE), Urine Formation (1842), Homeostasis (1854). Small fish scatter as a blue marlin rises to the ocean surface. 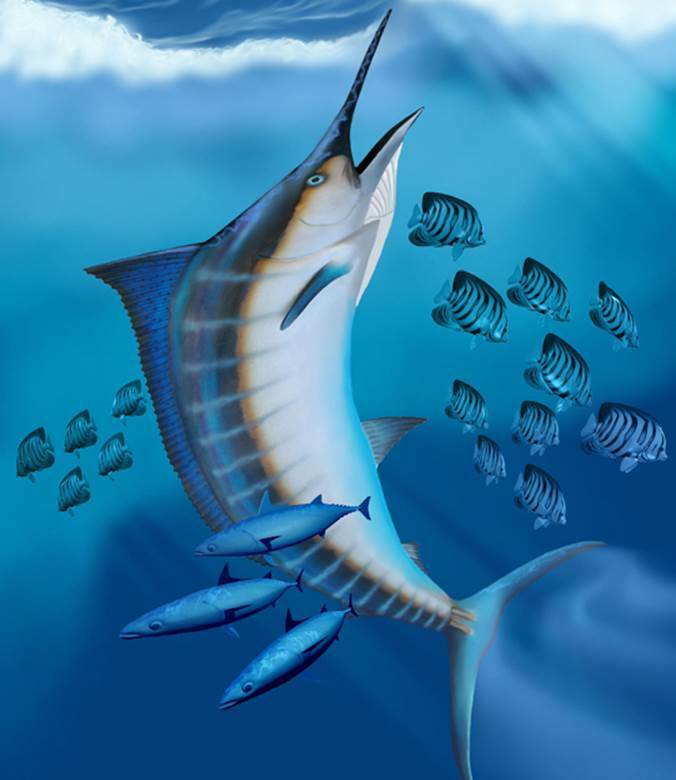 Marine fish, such as this marlin, live in an environment in which the surrounding water is more concentrated than their body fluids. Their gills and kidneys endeavor to conserve water by actively removing salts from their body.